The hTERT (human telomerase reverse transcriptase) gene contains five variable number tandem repeats (VNTR) and previous studies have described polymorphisms for hTERT-VNTR2-2nd. We investigated how allelic variation in hTERT-VNTR2-2nd may affect susceptibility to prostate cancer. A case-control study was performed using DNA from 421 cancer-free male controls and 329 patients with prostate cancer. In addition, to determine whether the VNTR polymorphisms have a functional consequence, we examined the transcriptional levels of a reporter gene linked to these VNTRs and driven by the hTERT promoter in cell lines. Three new rare alleles were detected from this study, two of which were identified only in cancer subjects. A statistically significant association between rare hTERT-VNTR2-2nd alleles and risk of prostate cancer was observed [OR, 5.17; 95% confidence interval (CI), 1.09-24.43; P = 0.021]. Furthermore, the results indicated that these VNTRs inserted in the enhancer region could influence the expression of hTERT in prostate cancer cell lines. This is the first study to report that rare hTERT VNTRs are associated with prostate cancer predisposition and that the VNTRs can induce enhanced levels of hTERT promoter activity in prostate cancer cell lines. Thus, the hTERT-VNTR2-2nd locus may function as a modifier of prostate cancer risk by affecting gene expression. Telomeres play a critical role in the maintenance of genomic stability in all eukaryotes . Telomerase, a ribonucleoprotein complex with RNA template and catalytic subunit hTERT core components, is able to add reiterated telomeric repeat sequences to the very ends of chromosomes. While the telomerase RNA template is present in almost all human cells, hTERT was found to be rate limiting for telomerase activity [2, 3]. Telomerase expression is confined primarily to the germ line and regenerating tissues in adults [3, 4]. Activation of telomerase to maintain telomeres is required for self-renewal and proliferative expansion of a number of cell types, including stem cells, activated lymphocytes and cancerous cells [2, 3, 5]. Human telomerase is highly active in more than 85% of primary cancers, but not in most differentiated somatic tissues. Ectopic expression of hTERT in otherwise mortal human cells induces efficient elongation of telomeres and permanent cell growth [2, 3, 5]. In our previous work, we described the isolation and characterization of the complete genomic human telomerase gene . The hTERT gene contains four blocks of polymorphic minisatellite regions: two blocks of VNTRs within intron 2 (VNTR2-1st and VNTR2-2nd) and two within intron 6 (VNTR6-1st and VNTR6-2nd) [6, 7]. In a previous study, we found that hTERT-VNTR2-2nd contains minisatellites with 61-bp periodicity. We identified four alleles of hTERT-VNTR2-2nd ranging from 40 to 44 copies of the 61-bp repeat unit, with 44 the most common, and a corresponding degree of heterozygosity of 0.476 . The repeats diverge by approximately 10%. Analysis of segregation of the minisatellites in families revealed that all four VNTR alleles are transmitted in a Mendelian inheritance pattern . Despite the lack of understanding about the function of repetitive DNA, these elements have been implicated in the pathogenesis of human genetic disease [8–11]. VNTR polymorphisms have also been reported to affect gene expression [12, 13]. The high level of VNTR polymorphism and consequent heterozygosity pose a problem as to what haplotypes are present in a given cell and which of them is responsible for gene expression. Comparison of normal and cancer tissue from patients revealed rearrangements of at least two VNTR regions of hTERT, suggesting that the minisatellites might be associated with activation of telomerase expression in cancer cells . Many repeats of hTERT-VNTR2-1st include the canonical CACGTG binding site of the MYC family of oncogenic transcription factors, that is also present in the promoter region; overexpression of c-MYC activates hTERT transcription through this promoter element [6, 14]. In this study, we investigated how allelic variation in hTERT-VNTR2-2nd affects susceptibility to sporadic cancers of the prostate. A case-control study using a PCR-based method was performed to compare the allelic distribution of hTERT-VNTR2-2nd in DNA samples from cancer-free controls and patients with cancer. We identified three novel minisatellite alleles in the hTERT-VNTR2-2nd region. Furthermore, to determine if the VNTR polymorphisms are functional, we examined the transcriptional levels of a hTERT promoter-driven reporter gene in the presence of VNTRs with a varying number of repeats in prostate cancer cell lines. Our results indicate that allelic variations in the minisatellites of hTERT-VNTR2-2nd may be related to susceptibility to prostate cancer by affecting the expression level of hTERT in cancer cell lines. The degree of minisatellite polymorphism in hTERT-VNTR2-2nd was assessed in 421 unrelated healthy adult males. In addition, we performed a case-control study in which we compared DNA from these 421 cancer-free controls to samples obtained from 329 patients with prostate cancer. Controls were selected from the Department of Preventive Medicine and Internal Medicine of Dong-A University hospitals between 2000 and 2004 (Busan, Korea). A total of 421 male individuals in the control group who had no personal history of cancers or current cancer were recruited and completed an interview. The controls had a similar age distribution to the cancer patients (control mean age, 66.7 y, range 50-89 y; patients mean age, 67.9 y, range 50-88 y). Subjects were recruited from five different hospitals in four different cities in Korea: Dong-A University Hospital and Busan Paik Hospital in Busan, Chungbuk National University Hospital in Cheongju, Asan Medical Center in Seoul, and Ulsan University Hospital in Ulsan. Prior to collection, each participating subject provided his informed consent. The Committees of Bioethics of Dong-A University [#IRB-06-10-02 & IRB-07-10-7; Busan, Korea] and Chungbuk National University Hospital [#IRB-2006-1; Cheongju, Korea] approved the study design and procedures. To assess the degree of polymorphism of hTERT-VNTR2-2nd, we analyzed genomic DNA samples from 329 prostate cancer patients and 421 healthy, unrelated adult males. For PCR experiments, genomic DNA from peripheral blood lymphocytes was extracted as described . Primer sequences used in this study are as follows: hTERT-VNTR2-2nd F-TGGGAGCATCACTCACAGGA and hTERT-VNTR2-2nd R-GGAACACAGCCAACCCCTTA . PCR analysis of human DNA samples was performed using the Promega Go Taq polymerase (Promega, WI) with 100 ng genomic DNA. Genomic DNA was amplified using primers under the following standard PCR conditions: 50 mM KCl; 10 mM Tris-HCl, pH 9.0; 3 mM MgCl2; and 0.2 mM dTTP, dCTP, dGTP, and dATP in a final volume of 40 μl. PCR was conducted in a 9700 Thermalcycler (Perkin-Elmer, CA, USA) with cycle conditions consisting of 94°C for 2 min, 30 cycles of 45 sec at 94°C and 69°C for 2 min 30 sec. The last elongation step was extended to 7 min at 72°C. PCR products were analyzed by gel electrophoresis (1 volt/cm) in TAE buffer through 0.8% agarose gel. 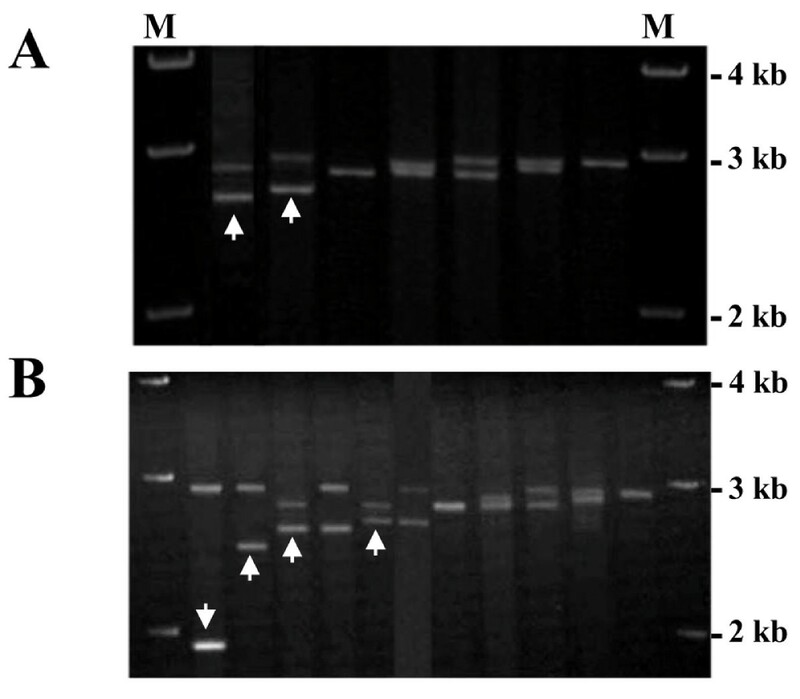 Three newly identified hTERT-VNTR2-2nd alleles were amplified from human genomic DNA using a PCR method for sequencing (Figure 1). After electrophoresis, the PCR products were extracted using a gel extraction kit (Qiagen, CA), and the repeat sequence of the PCR product was analyzed. Allele typing at hTERT -VNTR2-2 nd in cancer-free controls and patients with prostate cancer. (A) Electrophoretic patterns of PCR products of hTERT-VNTR2-2nd in controls. Four hTERT-VNTR2-2nd alleles and six haplotype patterns were detected in DNA from 421 cancer-free male controls. One new rare allele (39 copies of the repeat unit) and one previously reported rare allele (40 copies) identified in the control group are indicated with arrows. (B) Electrophoretic patterns of PCR products of hTERT-VNTR2-2nd in patients with prostate cancer. Seven hTERT-VNTR2-2nd alleles and eleven haplotype patterns were detected in DNA from 329 patients with prostate cancer. The three new rare alleles (28, 37, and 39 copies) and one previously reported rare allele (40 copies) identified in prostate patients are indicated with arrows. The 28- and 37-copy alleles were detected only in patients with prostate cancer. The first and last lanes correspond to a 1-kb marker (M). A fragment of the hTERT promoter (-304 to +40)  was amplified from a bacterial artificial chromosome clone containing the hTERT genomic sequence  and inserted into KpnI/NheI sites of the luciferase reporter vector pGL3-Basic (Promega) to generate the pBT304 construct (Figure 2-A). Two common alleles (TR42, TR44) and three rare alleles (TR28, TR37, TR39) were amplified from genomic DNA from patients with prostate cancer (Figure 1-B) and inserted into the BglII/SalI sites of pBT304 to make the reporter plasmids pBT304+TR28, pBT304+TR37, pBT304+TR39, pBT304+TR42, and pBT304+TR44, respectively (Figure 2-A). All plasmids containing TR were also constructed in the reverse orientation in the reporter to examine the effect of TR orientation on gene expression. Moreover, to compare the effect of similarly sized irrelevant DNA sequences on luciferase expression, the pBT304+2443 plasmid was made by insertion of a 2443-bp fragment (UCSC, >hg18_dna; Chr5: 4359328-4361770) into the BglII/SalI sites instead of TR. All constructs were confirmed by DNA sequencing. Effect of allelic types of hTERT -VNTR2-2 nd in hTERT -promoter luciferase constructs. (A) The structure of the pBT304 (#1) and TR reporter constructs. The gray square indicates the hTERT promoter region. The open square represents the open reading frame of luciferase. The black squares include the VNTR polymorphic regions of hTERT-VNTR2-2nd. Five different sizes of TR (28-44 copies) were inserted in the pBT304 plasmid: pBT304 + TR28, pBT304 + TR37, pBT304 + TR39, pBT304 + TR42, and pBT304 + TR44 (#2-6). All TR-containing plasmids were constructed in both the forward and reverse directions of the reporter gene. The pBT304+2443 plasmid (#7) was made by insertion of an irrelevant 2443-bp fragment instead of TR. (B) The effects of VNTR polymorphism on hTERT gene expression in the luciferase reporter system. Four different cell lines (293T, embryonic kidney, RWPE-1, prostate, LNCap and PC-3, prostate cancer) were transfected with 12 different plasmids [#1-7, with paired forward- and reverse-TR-containing constructs (#2-6)]. * denotes statistical significance (P < 0.05). The following human cell lines were examined for the effect of VNTRs on hTERT expression: 293T/HEK293T (human embryonic kidney cell line obtained from the Korean Cell Line Bank (KCLB), South Korea), RWPE-1 (prostate cell line obtained from the American Type Culture Collection (ATCC), USA), PC-3 (prostate cancer cell line obtained from KCLB), and LNCap (prostate cancer cell line obtained from KCLB). For the luciferase assay, cells (1 × 105) were seeded in 12-well plates, cultured overnight, and transfected with the hTERT promoter-luciferase plasmids (0.5 μg per well) by using the FuGENE6 transfection reagent (Roche Diagnostics, USA) at a ratio of DNA to FuGENE6 of 1:3. The cells were analyzed using a dual-luciferase reporter assay system (Promega) 48 h after completion of the transfection procedure. Firefly luciferase activity was normalized according to Renilla luciferase activity and expressed as relative luciferase units to reflect promoter activity. Triplicate transfections of each construct were examined for each experiment, and final results were calculated from four independent experiments. The degree of polymorphism, which ranges from 0 to 1, generally increases with the number of alleles. To evaluate the probability of two randomly chosen alleles being different (heterozygosity) at a given locus, a measure of genetic diversity was calculated using the method described by Chakravarti and Lynn . Regression analyses were performed to determine the odds ratios (ORs) of associations between control and patient groups. ORs were estimated using the natural logarithm and its standard error. Where relevant, we used a chi-squared test with one degree of freedom to assess statistical significance. Differences were considered significant for confidence intervals (CIs) of 95%. All tests were two-sided, with P < 0.05 considered statistically significant. Statistical analyses were performed using MS Excel with CHITEST and R statistical software (v2.5.1, http://www.r-project.org) with chisq.test for the calculation of chi-squared values. In this study, we analyzed the degree of polymorphism within the hTERT-VNTR2-2nd repeats by PCR amplification of human genomic DNA samples isolated from 421 cancer-free males and 329 prostate cancer patients (Figure 1). We assessed the degree of heterozygosity in each sample group according to allelic distribution. The heterozygosity of hTERT-VNTR2-2nd was 0.4782 in controls and 0.4964 in prostate cancer patients, with no statistically significant difference between the two groups. We identified 5 alleles in 421 control samples ranging from 39 to 44 copies of the 61-bp repeat unit, with 44 copies present in the most common allele (Table 1). Compared to a previous report , we observed one novel allele, with 39 copies of the 61-bp repeat unit, in the control group (Figure 1-A). We also observed two additional novel alleles, of 28 and 37 copies, in the prostate cancer group (Figure 1-B). Thus, three new alleles were identified at the hTERT-VNTR2-2nd locus in this study: one in controls and two cancer-specific alleles in prostate cancer patients (Table 1). The genotype distribution of hTERT-VNTR2-2nd variants in prostate cancer patients and control subjects is shown in Table 2. Eleven patterns were identified in prostate cancer patients; only six patterns were observed in controls (Figures 1-A and 1-B). Five rare cancer-specific genotypes were identified in patients with prostate cancer (28/44, 37/44, 39/44, 40/42 and 40/44) (Figure 1-B and Table 2). For further analysis, hTERT-VNTR2-2nd alleles were grouped into two sets (common and rare alleles), according to their frequency in the control population. The expected frequency for rare alleles was considered ≤1% in this study. Analysis of the genotypes found in individual cancer patients and healthy controls revealed that having a rare allele (2.43% of patients, 0.48% of controls) was associated with relative prostate cancer odds of 5.22 (CI: 1.10-24.76; P = 0.02) (Table 2). Furthermore, the repeat sizes of all rare alleles (28, 37, 39 and 40 copies) were shorter than common alleles (42, 43, and 44 copies). Therefore, there is a statistically significant risk for developing prostate cancer associated with the presence of shorter, rare alleles. Table 3 summarizes the frequency of rare and common hTERT-VNTR2-2nd alleles (haplotype) among cancer patients and controls. Interestingly, in patients with prostate cancer, the total rate of rare hTERT-VNTR2-2nd alleles was 1.22%, compared to 0.24% in cancer-free male controls. Analysis of these data revealed a statistically significant association between rare hTERT-VNTR2-2nd alleles and risk of prostate cancer (OR, 5.17; 95% CI, 1.09-24.43; P = 0.021) (Table 3). We further analyzed the hTERT-VNTR2-2nd allele types on the basis of subject age. Table 4 shows the genotype distribution in patients according to age at diagnosis and in controls according to age at the time of study enrollment. In the control group, we found that there was no difference in the frequencies of short rare alleles between younger (<65 years) and older (≥65 years) individuals (P = 0.21). In comparison to older patients (≥65 years), however, we found that younger patients (<65 years) had an increased ratio (3.79, CI: 0.89-16.18; P = 0.05) of association between rare hTERT-VNTR2-2nd alleles and prostate cancer. The frequency of rare alleles was higher in younger cases (4.9%) than in older cases (1.3%). Specifically, a comparison between controls and cancer patients by age group demonstrated a statistically significant difference (P = 0.02) in the association ratio between prostate cancer and rare hTERT-VNTR2-2nd alleles in younger patients (Table 4). We used additional clinicopathological information collected from 2005-2006 at the Asan Medical Center in Korea [17, 18] and in 2006 at the National Cancer Center in Korea  (Table 5) to further characterize prostate cancer patients. Tumor, node, and metastases (TNM) stage and histopathological classifications were analyzed according to the World Health Organization (WHO) system. Prostate cancer was evaluated using TNM stage, Gleason score, prostate-specific antigen (PSA), Jewett-Whitmore system, and the Tumor grade (Table 5). Prostate tumors were grouped according to their classification, and we then estimated the frequency of each stage in the total cancer group and in the rare allele group by Pearson's chi-squared test (Table 5). *Data of Asan Medical Center, Korea; ** Data of National Cancer Center, Korea; *** Pearson's Chi-squared test was performed between total cases with prostate cancer and cases with rare alleles used in this study. We determined the proportion of TNM stages within the short rare alleles group and the prostate cancer group. The frequency of short rare allele patients in the T4 stage was slightly higher than in the total prostate cancer group (P = 0.1110), and the frequency of short rare allele patients in the N1 and M1 stages was significantly higher than in the total prostate cancer group (P = 0.0146 and P = 0.0422, respectively). We then classified patients into three different ranges of PSA, a biomarker for detecting prostate cancer , to determine the relationship between PSA level and short rare alleles in the prostate cancer group. Although three of the eight patients with rare alleles showed high levels of PSA (>20 ng/ml), no statistically significant differences were observed due to the small group size. According to the Jewett-Whitmore system, prostate cancer is classified according to anatomical view and spread. A and B are early stages; stage C and D cancer invades most of the prostate and spreads to other organs/tissues . In the present study, 10.7% of patients were classified as group A, 38.4% as group B, 20.4% as group C, and 30.5% as group D. Prostate cancer patients with rare alleles were distributed as follows: A (0%), B (12.5%), C (12.5%), and D (75%). The frequency of patients with a rare allele in the 'D' group was higher than in the total prostate cancer group, but, as with T4 staging and PSA level, no statistically significant difference was observed (P = 0.0605) in the Jewett-Whitmore system. To determine if VNTR polymorphisms affect hTERT expression levels, we constructed reporter vectors that contained the hTERT promoter, luciferase gene, and one of five differently sized VNTR repeats ranging from 28 to 44 copies of the 61-bp tandem repeat region of hTERT-VNTR2-2nd (PCR product sizes: approximately 1,930-2,900 bp) inserted in the enhancer region of the pGL3-Basic vector (Figure 2-A). The effects of these VNTRs in cell lines were examined by transfection of the luciferase plasmid pBT304 with or without each VNTR repeat variant. 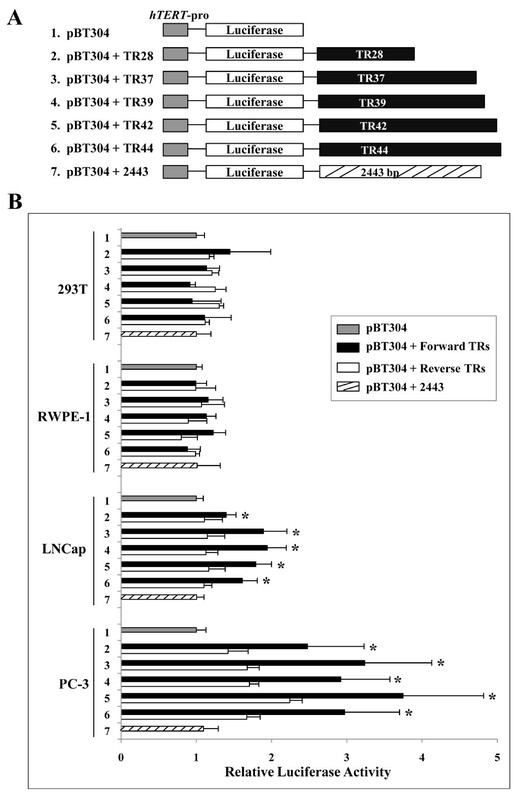 In 293T (human embryonic kidney cell line) and RWPE-1 (human prostate cell line) cells, no statistically significant differences in luciferase activity were observed between controls (pBT304 and pBT304 + 2443) and VNTR-containing cells (pBT304 + TR, with both orientations of five different TRs) (Figure 2-B). Interestingly, when we transfected these plasmids into two different prostate cancer cell lines (PC3 and LNCap cells), luciferase assays revealed that forward-VNTRs stimulated the activity of the hTERT promoter, leading to approximately 1.4 to 1.9-fold increases in relative luciferase activity in LNCap cells and 2.5 to 3.7-fold increases in PC3 cells (Figure 2-B). Notably, the PC3 cell line demonstrated a greater increase in luciferase activity as compared to the LNCap cell line. However, when we recalculated relative luciferase activity by comparing the forward- and reverse-VNTRs of each variant, the increase in luciferase activity was similar in both cell lines, ranging from 1.4 to 1.7-fold in LNCap cells and 1.7 to 1.9-fold in PC3 cells. Similarly sized irrelevant DNA sequences (pBT304 + 2443) had no effect on luciferase expression. A characteristic of tandem repetitive sequences is their ability to give rise to variants that contain increased or decreased numbers of the repeat unit. A recent study of genetic factors involved in susceptibility to insulin-dependent diabetes mellitus demonstrates the importance of population-based association studies in understanding the effects of VNTRs . Some minisatellite alleles are associated with human disorders and with differential expression of a nearby gene , which lends support to the concept that variations in a minisatellite locus may have biological significance. Case-control studies have implicated rare HRAS minisatellite alleles in cancer risk [24, 25], and specific HRAS minisatellite alleles have demonstrated enhancer or suppressor activity in vitro . VNTRs in introns may also affect mRNA splicing . In addition, rare VNTR alleles have been associated with a higher risk of various types of cancer [10, 23, 28]. These findings suggest a potential biological role for rare minisatellite alleles in cancer predisposition; however, the nature of the phenomena underlying the association between minisatellites and cancer has remained unclear. Telomerase activity is detected in approximately 85% of malignant tumor cells, and its presence can be used to diagnose cancer . Regulation of the hTERT gene is a major factor in telomerase activity , and the expression level of hTERT is highly correlated with telomerase activity in normal and cancer cells . hTERT includes four polymorphic minisatellites, 42- and 61-bp minisatellites in intron 2 (VNTR2-1st and 2-2nd) and 38- and 36-bp minisatellites in intron 6 (VNTR6-1st and 6-2nd), as well as an apparently monomorphic 28-bp minisatellite in intron 12 (TR12) . The influence of these minisatellites on gene expression is not known, but they may intervene in regulatory mechanisms affecting hTERT expression. The DNA from cancer tissues of one patient with a kidney tumor had a simultaneous rearrangement of hTERT-VNTR6-1st and 6-2nd [6, 7], an observation that suggests that chromosomal rearrangements involving these VNTRs may be associated with the activation of telomerase expression in cancer. Moreover, according to reports by Wang et al. , MNS16A, which is located downstream of hTERT, was reported to have an effect on hTERT expression and telomerase activity. In a previous study, we characterized hTERT-VNTR2-2nd as having four alleles containing a different number of the repeat unit in 103 normal, unrelated individuals , and we found in a pilot study that hTERT-VNTR2-2nd regulated hTERT promoter activity in a reporter gene assay. We hypothesized that hTERT-VNTR2-2nd polymorphisms could play a role in activating hTERT during tumorigenesis. The present case-control study was performed on DNA from 421 cancer-free male controls and patients with 329 prostate cancers using PCR methods to determine the frequency of rare alleles. These data suggest a statistically significant (P = 0.021) increased incidence of rare hTERT-VNTR2-2nd alleles in prostate cancer patients (1.22%) compared to male controls (0.24%). Moreover, the frequency of rare alleles among prostate cancer patients was significantly higher in younger patients (4.9%) than in older patients (1.3%) (P = 0.02). These results suggest that rare hTERT-VNTR2-2nd alleles may be genetically associated with prostate cancer. Prostate cancer is often diagnosed at an advanced stage, and metastatic prostate cancer is incurable. Although the advent of the PSA test and increased public awareness have improved early detection rates, a large number of patients still die of metastatic prostate cancer, reflecting the presence of occult metastatic disease . The diagnosis of early-stage prostate cancer is imperative for its successful treatment, but the methods employed in diagnosis suffer from significant limitations. Here, we found a different proportion of TNM stages between the short rare-allele group and the prostate cancer group as a whole. Prostate cancer tissue classified as M1-stage, N1-stage, or Jewett-Whitmore group 'D' is associated with a poor prognosis. Using the Jewett-Whitmore system, the frequency of cases with a rare allele in the 'D' group was higher than in the total prostate cancer group, but no statistically significant difference was observed due to the limited number of samples. However, there were significant relationships between the short rare allele and the appearance of regional lymph nodes (N1 stage) and metastasis (M1 stage). These results suggest that prostate cancer patients with rare hTERT-VNTR2-2nd alleles have a poorer prognosis than patients with common alleles. This study is the first to calculate the risk of prostate cancer attributable to rare hTERT-VNTR2-2nd alleles and report that rare hTERT-VNTR2-2nd alleles of the human telomerase gene contribute to prostate cancer predisposition in the general population. This finding may prove useful as a diagnostic biomarker of increased risk for prostate cancer and cancer progression, though the short rare alleles group is too small to be common in prostate cancer cases. Further research is necessary to identify the specific minisatellite variants that confer predisposition and to further evaluate the associations between hTERT-VNTR2-2nd alleles and cancers of the prostate. Sequence analyses highlighted possible mechanisms underlying the relationship we observed between hTERT-VNTR2-2nd alleles and prostate cancer. When the minisatellite sequences were analyzed using the Transfac software (MATCH™ public version 1.0; http://www.gene-regulation.com/pub/databases.html), we found five putative binding sites for the transcription factor, estrogen receptor 1 (ER1), in the repeat region of hTERT-VNTR2-2nd. The estrogen receptor α subunit is expressed in androgen receptor-dependent prostate cancer, suggesting that the ER pathway may be involved in prostate cancer. We also found binding sites in repeat regions for the transcription factors v-ErbA (5 sites) and NF-kappaB (3 sites), which are related to cancer development [33–35]. However, these latter sites were found by scanning all of the putative regulatory elements (minisatellites, etc. ), including those in introns. In a report by Brandt et al. , a transcriptional regulation mechanism has been described that depends on the length of a CA repeat in intron 1 (CA simple sequence repeat 1) of the EGFR gene. This mechanism may also be involved in regulation of the hTERT gene, with oncogenic proteins binding to sites in repeat regions and stimulating hTERT expression during cancer progression. On the basis of these putative binding sites, we investigated the effects of VNTR polymorphism on hTERT gene expression in cell lines by using the luciferase reporter system to observe the effect of VNTRs on the hTERT promoter. In PC3 and LNCap prostate cancer cell lines, all five VNTR constructs enhanced the activity of the hTERT promoter, but with no clear relationship between the number of repeats and the change in expression. This finding may be indicative of the limitations of in vivo transient transcriptional regulation assays. Alternatively, the high density of putative binding sites within the repeat array for transcription factors such as ER, v-ErbA and NF-kappaB may enhance hTERT gene expression independently of the number of tandem repeats. When we examined the luciferase activity of the hTERT promoter that included the VNTRs in gastric cancer, no increase was detected (data not shown). Therefore, the high density of putative binding sites within the repeat array for transcription factors such as ER may enhance hTERT gene expression with cell line specificity. Our findings suggest that non-coding regions such as minisatellite repeat regions may influence gene activity. Further investigations of the epidemiological associations between minisatellites and cancer, and the role of repeat regions in gene regulation, are warranted. This study should also provide a helpful reference for understanding the possible function of minisatellites and the complex genomic properties of genes. 1Department of Biology and Biomedical Science, Dong-A University, Busan, South Korea. 2Department of Urology, College of Medicine, Dong-A University, Busan, South Korea. 3Korean BioInformation Center, KRIBB, Daejeon, South Korea. 4Department of Urology, College of Medicine, Chungbuk National University, Cheongju, South Korea. 5Department of Urology, College of Medicine, Busan Paik Hospital, Inje University, Busan, South Korea. 6Department of Urology, College of Medicine, Asan Medical Center, Ulsan University, Seoul Korea. 7Department of Urology, College of Medicine, Ulsan University Hospital, Ulsan University, Ulsan, South Korea. This work was supported by the Basic Science Research Program, through the National Research Foundation of Korea (NRF) funded by the Ministry of Education, Science and Technology (2010-0001735) and by FG06-11-06 of the 21C Frontier Functional Human Genome Project from the Ministry of Science & Technology. SLY conceived of the study and carried out the PCR amplification, vector construction and luciferase assay. EJD and SRL performed sample selection, genomic DNA preparation and PCR amplification. SYL and ISC carried out the statistical analyses, bioinformatic analysis and contributed to the interpretation of the results. SIJ, WJK, JIJ, CSK and SHC collected the samples, investigated the clinical records of the patients and contributed to the interpretation of the results. SHL designed the study concept, interpreted the results and drafted the manuscript. Other: All authors approved the version to be published. SHL is guarantor.